Railway Group D Vacancy 2018 will recruit in UP, Bihar, Delhi, Other District. 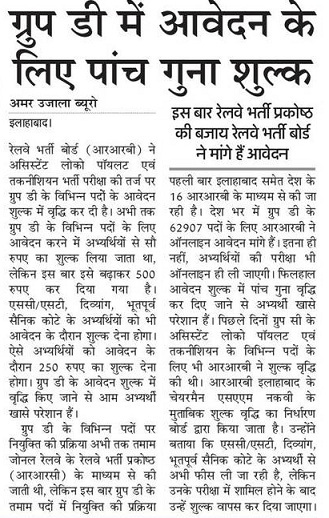 Total 2.5 Lakh Railway Group D Recruitment will be upcoming in current or next year said by railway recruitment board and cell. Candidates who passed in 10th are eligible to apply for ITI and Non ITI Vacancy in Railway. 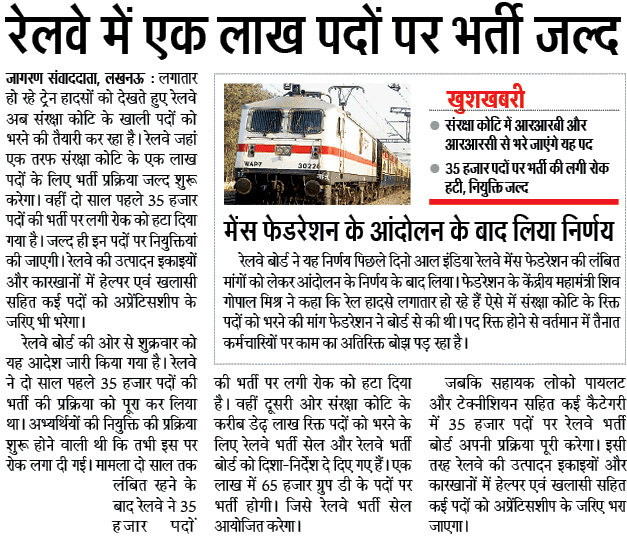 It been long time Railway recruited candidates and joining will be soon completed by Allahabad Railway Group D Board. 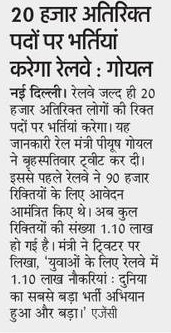 Approx every year more than 20,000 people retired from railway group d department but vacancy does not fill because on not organizing cabinet meeting. 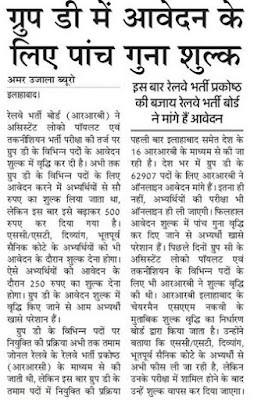 Railway Loco Pilot Latest News 1 August 2018:- Railway Group D Vacancies going to attend on exam centers from 8th August 2018.RRB Choirman MS Naqvi said we have sent 3.5 Lakh candidates to MP, Punjab and Rajasthan because 9.5 Lakh candidates belonging to Uttar Pradesh. 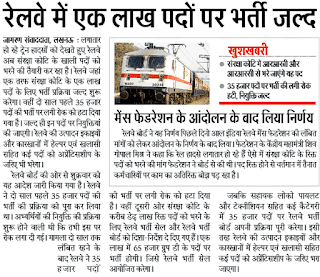 Note:- You will have to travel more than 1,000 KM to give railway Loco Plot and Technician exams. Railway Government Jobs 2018:- Indian Railway has added More 20,000 Jobs of RPF, RPSF Head Constable and these Railway Protection Force and Special Emergency Force filled in Level 1 2 vacancies. Level 2:- 10,000 Vacancy of RPSF (Railway Police Special Emergency Force). 1,10,000 Total Vacancy are their in 2018. Railway Group D 62,907 Bharti 2018: Latest 03.01.2018 news is Railway going to published the ads of Group D 72000 Posts in the Month of January to Feb 2018….you may also check notification below. 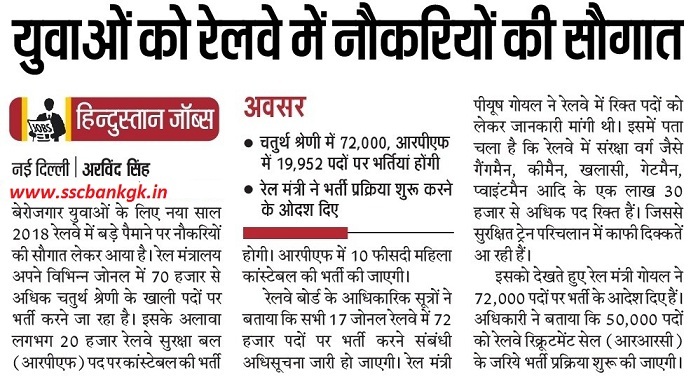 Railway 10 Lakh Jobs 2018: railway to invest 150 billion for creating 1 million jobs in 5 years.Railway Minister Piyush Goyal Said with in 1 year it is expected to born 10 Lakh jobs in the field of Railway Tracks, Over Bridge Maintainence, Platform and Security of Railway Gate. Railway 1 Lakh Recruitment 2018: Indian railway department of said in a statement to recruit 1 Lakh Vacancy in Safety department soon with Online application form. Railway Group D Syllabus 2018 Question Paper: - Candidates will be called for online test conducted in this regard. The candidates obtaining highest marks in the Railway Group D written exam called for verification of related documents and physical fitness. 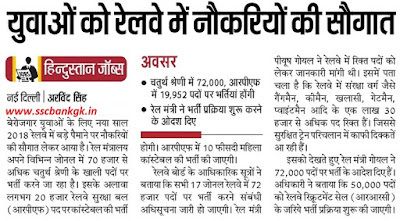 It is estimated that in Upcoming Railway vacancies RRB may release the 2 Lakh + jobs from qualification 10th, Graduate pass, Master Degree and ITI Diploma passed candidates. Age Limit For Upcoming Vacancy in Railway Group D: Candidate’s age must not minimum 18 years and not maximum 33 years as on last date. Age Relaxation applicable as per the rules is given according to SC ST OBC Quota. Pay Scale: candidates who will get joining will be appointed at Rs. 5200-20200/- with Rs. 2000/- Grade Pay. Educational Qualification For Railway Group D vacancy 2018: Candidate must passed 10th, 12th or its equivalent form recognized Board. Selection Procedure: Candidates will be selected om Written Exam, Physical Efficiency Test and Medical Examination. Application Fees For Railway Group D Online Application Form 2017: Candidates must pay the fee of Rs.100/- only for general category n the form of Indian Postal Order or SIGN AS crossed Indian Postal Order. C/ ST, Ex-Servicemen, Women candidates, PWD, Minority candidates are exempted. How to Apply: Interested and eligible candidates must send their application in prescribed format by attaching postal orders, demand drafts available in the notification.